this story comes from the archives of ” the journey of jellybean road ” 2013. A neighbour rang up yesterday asking for me. She’s not here,Greg says. I just wondered if she would like some tomatoes. Greg replies with a chuckle, Sandra always wants tomatoes. Then tell her I am going away for four days but if she can come after 5 tonight she can get some. I arrive home exhausted, the little king had been wild and rambunctious running rings around me and his mum and his aunty all thru town. I am thinking a cuppa ,a sit down with feet up and watch the thornbill flit about the house. Often we get house birds – a wren a grey thrush ,some of them find a way in thru the glasshouse or an open door and skippity skippity around the kitchen benches. I whine a little when I get the message but John offers to come with me. It is dusk and we have to hunt thru thick kikuyu grass for the golden tomatoes then we pick the orange ones the red ones and finally the green tigers. From there we move onto zucchinis leeks and cucumbers as long as my arm. From Christas garden to the west is the deep blue of Wandella Mountain at 1000m standing alone adrift from the main range and stretching to the north the valley continues rising and falling until it collapses into the folding tapestry of mountains and rivers. Next door our forest is gleaming brightly and clearly visible is a tendril of smoke curling into the sky as someone kick starts Stanley for dinner . I had been paying little heed to the conversation between her and John at the other end of the garden but camels twigged my ears. What did you say I yell out moving closer to this story. I don’t have my specs on but even I can tell they have a hump. I look again at Christa, a solid woman in her usual outfit of blue t-shirt jeans and blundstones . You never really know what people have in them do you? ‘There are 800,000 wild camels in Australia ‘ she tells us. I didn’t know that but I have probably never thought about it either .We all laugh , camels in Wandella, how absurd how crazy . it is wonderful and our laughter stretches up and lifts into the sky. Already Christa has cows pigs sheep goats miniature ponies a llama 7 dogs plus hens ducks and geese. I am exhausted thinking about it all as I gaze around the yards the sheds the fences the work and try to stop another dog jumping on top of me. She points to the new camel shed and the high fencing. ‘They have been taught to tie’ she says ‘and the children give them saltbush every day’. Why? Why camels Christa, John wants to know. ‘I like them ‘she says with a shrug and a grin. Fair enough I can appreciate that. I do too. I like it all , the buckets full of produce at my feet,the idea that our wonderful crazy organic animal lover neighbour is off to Broken Hill to bring three basically wild camels back to live in Wandella . we head home in the gloaming my heart full of wonder at this life these stories these offerings of grandeur, of the night approaching and the first stars and the last calls from birds . 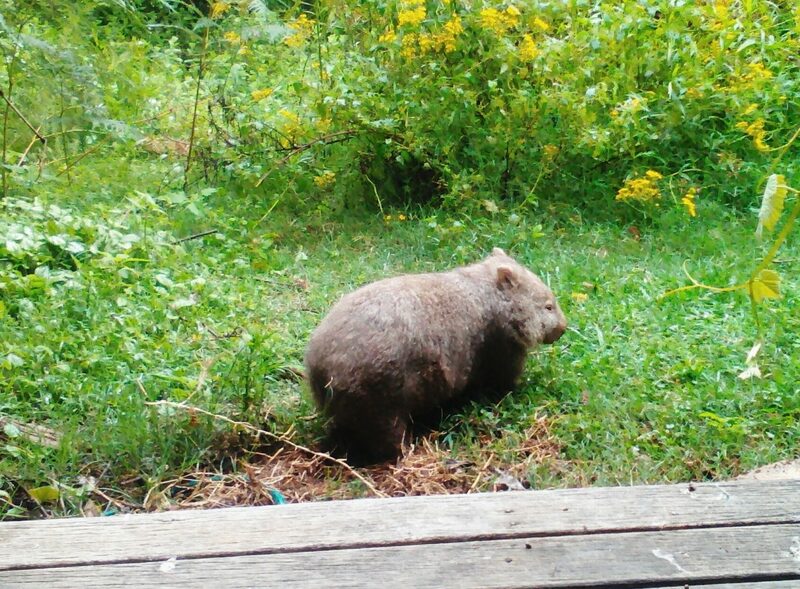 On the track into our forest we meet wombat wide awake and plodding about . The kitchen is warm with pots and pans bubbling on the top of Stanley. Jess says ‘we will be making relish tomorrow Kingston’ as he tears in tipping the bucket of veges onto the floor. Later that evening Jess yells for us to come out onto the verandah. Bring a torch. Kingston is doing his before bed piddle. Look , she says and there making its way up onto the verandah is a young diamond python. It is about two to three fingers width but has a huge lump halfway along its body. I think Kingston might have weed on it says Jess. That is probably a rat in it, says John hopefully. perhaps this is it , perhaps this is living like the gods. After all where else would they hang out but here with air crisp and fragrant, with soil generous and bountiful, with water fresh and sweet with wildlife gently going about their business. where else would we find the gods living? indeed , last count there was 7 or 8 camels next door – christa was sent the ones that were living down pambula way that had gone a bit mangy – which I think she has been treating with some success tho maybe lost one to it. at least her property is on a ridge so their feet tend to stay dryish.. Brilliant Sandra. Your words capture it all perfectly and I am right there with you knee deep in tomatoes. I do feel sorry for desert animals coming to live in lush Wandella though.